Do you remember when M. Night Shyamalan made good films? It was a short period between 1999 and 2002. Luckily this film got made by him in his not being terrible phase. Its story is very unique and it does get you thinking about what the hell is going on in this film. The performances here were very strong from a very small cast. In other words this film unlike many others don’t really have any comparative points which makes it a bit weird to review, but here we go. Actor Bruce Willis and writer/director M. Night Shyamalan reunite after the surprise success of The Sixth Sense for this supernatural thriller. David Dunne (Willis) is taking a train from New York City back home to Philadelphia after a job interview that didn’t go well when his car jumps the tracks and collides with an oncoming engine, with David the only survivor among the 131 passengers on board. Astoundingly, David is not only alive, he hardly seems to have been touched. As David wonders what has happened to him and why he was able to walk away, he encounters a mysterious stranger, Elijah Prince (Samuel L. Jackson), who explains to David that there are a certain number of people who are “unbreakable” — they have remarkable endurance and courage, a predisposition toward dangerous behavior, and feel invincible but also have strange premonitions of terrible events. Is David “unbreakable”? 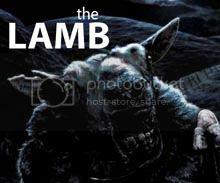 And if he is, what are the physical and psychological ramifications of this knowledge? Unbreakable also stars Robin Wright-Penn as Audrey, David’s wife; the supporting cast includes Spencer Treat Clark and Joey Perillo. Just as always I will not be giving away any spoilers so you don’t have to worry about reading this review before seeing the film. To start off let’s talk about the acting. 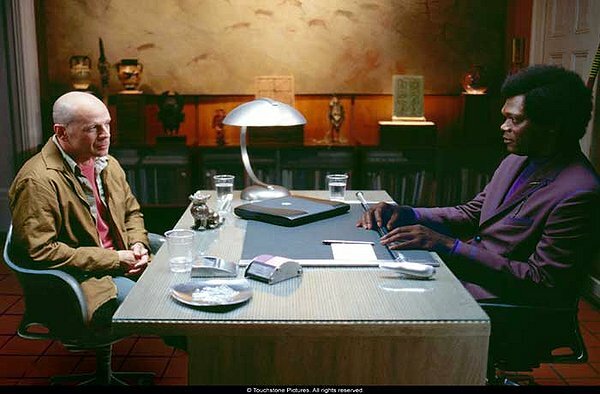 The acting was very good from its two main characters Bruce Willis and Samuel L. Jackson. The idea that its two main characters grew up in near opposite conditions created an interesting case of what in real life would cause a good guy and a bad guy. Seeing Samuel L. Jackson play a nearly crippled man who is so frail and does it so well is a bit of a weird performance to get used to but he does sell it really well. Bruce Willis’s role is a bit more normal for him but still it puts him in a more emotional role where he needs to be less emotional because he plays a character that doesn’t get what’s happening to him so has something missing from his life and has never found what that was until he meets Sam’s character. Ok so there are no real visuals that play around in this film so I will instead talk about the story itself. What I like about this films story is that it studies the possibility of a real world comic book hero and villain, would it be possible these people are out there and didn’t know what they could do? Could people have some of these powers that are just a bit more subtle than what is presented in the comics? These are very interesting questions this film asks no matter how far-fetched they are; I still tried to lift a car and turns out I can lift the back half of a small car (Watch out criminals!). Lastly before I go onto best reviews and my favourite scene I would like to talk about how M. Night Shyamalan has become utter crap! I mean seriously what happened to that man’s mind after Signs (the aliens didn’t like his portrayal?) In 2008 The Happening was terrible and I was like well he has clearly lost his touch and this was disappointing, but then he made a film so god awful that a part of my soul died when I watched it! That’s right The Last Airbender. You ruined a great story from an original tv show which I cannot forgive. M. Night Shyamalan is a lost cause. The best reviews I found would be these “Whereas The Sixth Sense left audiences surprised but surprisingly comfortable, this more mature and ambitious movie preserves its ambiguities and keeps everyone guessing.” Geoff Andrew. I honestly didn’t expect it to end the way it did. “Thrill-kill plots, cardboard characters and zap-pow editing are not for Shyamalan, who takes his good, thoughtful time to snare audiences in his dark web.” Peter Travers. Really? You don’t say Peter. My favourite scene without giving anything away would be the ending to be honest; it really makes the rest of the film make sense and is super good at throwing you off your seat. Thank God I haven’t seen Avatar…people kept telling me how bad it was and I quite like the animation and decided not to watch the movie. 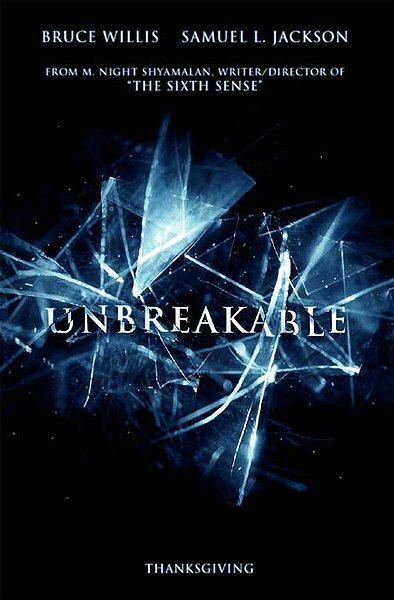 Unbreakable is awesome…I enjoy it a lot. I LOVE this movie, my favorite M Night film of all time and it’s got quite an enduring quality as I just rewatched it last year and it still made an impact. It’s one of those films that it’s best to watch knowing as little as possible, as I was quite floored by it. I agree w/ Turkey above in that this one is VASTLY Superior To “The Sixth Sense” because even after knowing the ending, I still don’t mind watching it again and again. Bruce Willis is a more versatile actor that people give him credit for. Such an enjoyable film – loved this, but still prefered Sxith Sense… that was amazing. Pitty that Shyamalan hasn’t made much else that I’ve enjoyed, because these two were great. So funny. My teacher, Sameena, actually worked on this movie along with Sixth Sense, Signs and The Village. She said knowing all the behind the scenes stuff makes it harder to appreciate the film. Sixth Sense was by far a better movie and a much better movie-making environment she said. His movies definitely went downhill after this one. I actually know a lot of folks in Hollywood, but most of them believe in misrepresenting aliens and terminators! Sameena said she had a hard time working on The Village. She hated it and actually fell asleep reading the script! She’s out of the biz now. Good review Tim. This one has a very eerie and paranoid feeling underneath the whole film and it works perfectly well with the source material. Wasn’t as great and amazing as everybody made it out to be, but it still packs a powerful punch in terms of story-telling and I wonder if we’re ever going to get that sequel that’s been talked about forever. My teacher said it was written as a trilogy. But Night never made the last two. He was asked to create a TV series based on the film, but he refused. This is one greatly under-appreciated movie. Glad it got some notice here. Good job. This wasn’t half as good as The Sixth Sense. I think I’m one of the few people who enjoyed The Happening; found it quite creepy. The people jumping off the building unsettled me. Very disturbing. Great film, Shyamalan’s slow and deliberate style worked perfectly here. An ordinary man discovers he is a superhero, in a quiet personal way. All superhero films should be as realistic as this one. Glad to see you give this film some praise. Always thought this was one of his best but nobody in my personal circle of friends gave it much credit. Yeah, I guess I would too, Sometimes we need the capes and bright colors! One of NIght’s best films. Too bad it didn’t last. “UNBREAKABLE” Is By FAR My Favorite M.Night Flick. Period. I Found It VASTLY Superior To “The Sixth Sense” In So Many Ways.